Labor Day weekend - means labor about the house. This year, a more than overdue project has to be done - or we have to use another means to get in/out of the house. 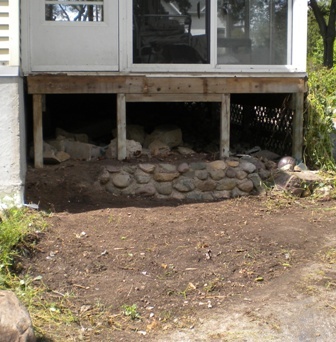 This project is our back porch (a quasi-deck). This was going to be a July 4th project, but other activities required that time. The railing wasn't leaning so much at that point, but by the end of July, it was like this. This porch was part of the house when we bought it and we suspect it is now at least 20 years old (could be more). 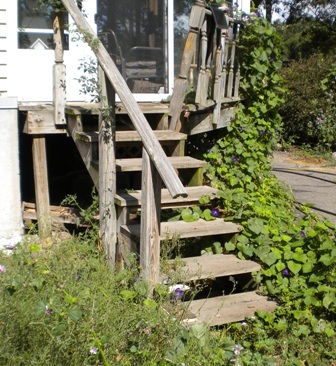 We haven't leaned against the railing in several years, in fact we kept a chair & planters there - to keep us from going to that side of the porch. As you can see... whoever build the entry porch did not use quality hardware, built to outlast a Michigan winter (aka shoveling w/ice melting salt). Additionally, as I took it apart - it turns out they liked "drywall" screws a lot. Definitely not made for external application! A least they did through-bolt the ledger and the posts. Too bad the posts were connected to a board held on by 3" drywall screws "into end grain". 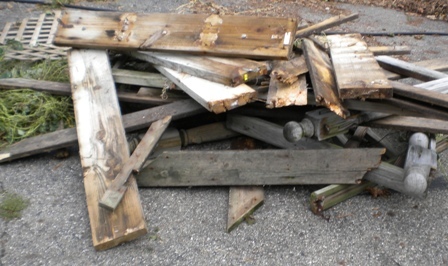 To clear out the work area - we have to create a pile of debris - all the parts of the porch will be moved to the backyard and much of it will become lawn ornaments. The house is about 90 years old so we aren't going to put up a "golden replacement"... it will be strong and serviceable. 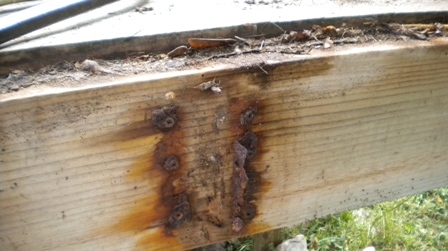 Modern hangers and appropriate decking screws. Stainless through-bolts. Alas... we will stick with modern treated wood. Composite would be way too expensive for this house.